Workshops for Teachers in Early Childhood Education. 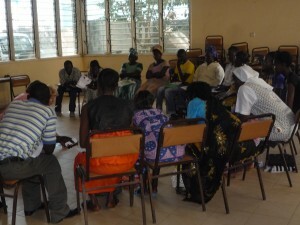 The decision to hold workshops for nursery school teachers in 2012 was made in response to requests from School Principals, Education Coordinators and Catholic Secretariat during the group’s first visit to The Gambia in 2011. The crucial importance of Early Childhood Education is appreciated. There is an urgent need to up-skill teachers working in this sector as many of them are untrained. The workshops were designed to explore and develop knowledge, skills and attitudes. Content is primarily based around Literacy, Numeracy, Planning and Classroom Management. The importance of active learning is emphasised. Resource making is an integral part of every session. The workshop model provides teachers with an opportunity to explore new ideas in Early Childhood Education and to interact with and learn from each other. Very many teachers attended the workshops over the past five years.In the last two years the emphasis has been on working with fifteen selected teachers who are now in a position to facilitate the workshops in 2017. Give will continue to support theses teachers as requested.